The easiest way of pizza braid recipe - dear pizza lovers this recipe will help you to cook pizza at home. follow these simple steps to cook pizza. 2. Lay out puff pastry. Place 4 slices of mozzarella and then 12 slices of pepperoni in the center of the dough. Cut diagonal lines along the left and right side of the cheese and pepperoni about an inch apart. Remove the corner pieces. Starting from the top, fold down the flap then alternate right and left until the bottom. Fold the bottom flap up and finish alternating between right and left. 3. 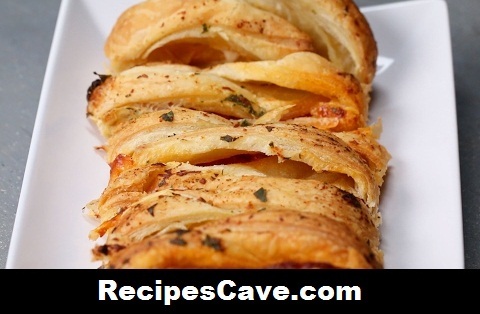 Place the braided puff pastry on a parchment paper lined baking tray. 4. In a small bowl, combine butter, garlic, parsley, and parmesan cheese. Brush all over until the top of the braid is fully coated. 5. Bake for 20 - 25 minutes or until golden brown.